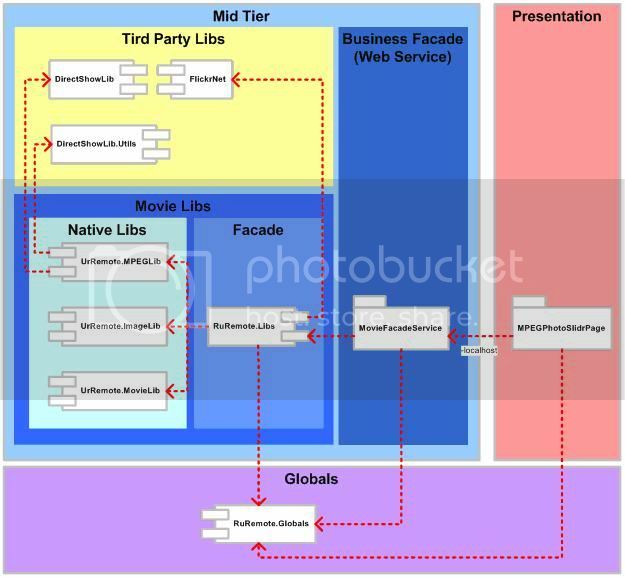 Presentation tier is an ASP.Net web page. It is use Wizard Control to take any step for creating a movie, gathering image information from image source and set up a movie option. All information then packed into a Class named Movie Option. This class will send to Business Façade (Web Service) that will process the movie. Notice that on this tier, application only gathers images information and movie options. There is no process to create movie or retrieving images. On presentation tier after user set all movie information and starting to precede movie creation, page will redirect to progressPageURL, and current thread will terminated. That’s why a Live Service is needed. If creating movie process attached on the page, that process will terminated when browser leave current page. Business façade is an ASP.Net Web Service. Service receives information from Presentation Tier that packed on Movie Option Class. And create process by instantiate appropriate class on the Movie Libs library. There are no authentication needed to instantiate or execute this service. Global tier used to managing exception for all tiers. All occurring exceptions saved on single SOAP file that can found on appropriate tiers directory (AppDomain.CurrentDomain.BaseDirectory). Movie libs separate into some libraries, depend on its functionality that is: Façade Lib, Image Lib, WMV Lib, MPEG2 Lib. Façade lib used to encapsulate all important method on movie libs tier. That makes object sharing between tiers simpler rather then reference to all libraries. Façade lib used Façade Pattern that aim to make simple dependencies between libraries, with this pattern other tier that access functionalities on movie libs only need reference to façade lib. Data access layer is a module that has functionalities to read and write data into database. This module has some functions that execute a stored procedure on the database. Component layer provide functionalities to retrieve images from image source (Flickr and Webjay) and supply functionalities to validate the availability user input (group, tags, play list, username). Image libs provide image processing module used by WMV lib. It has some function to process images such as resizing image, put subtitle and add 3D-style on image edge.